This weekend we went up to Melbourne to visit family. On our way up I spotted people's hard waste sitting innocently on the nature strip out the front of their houses. 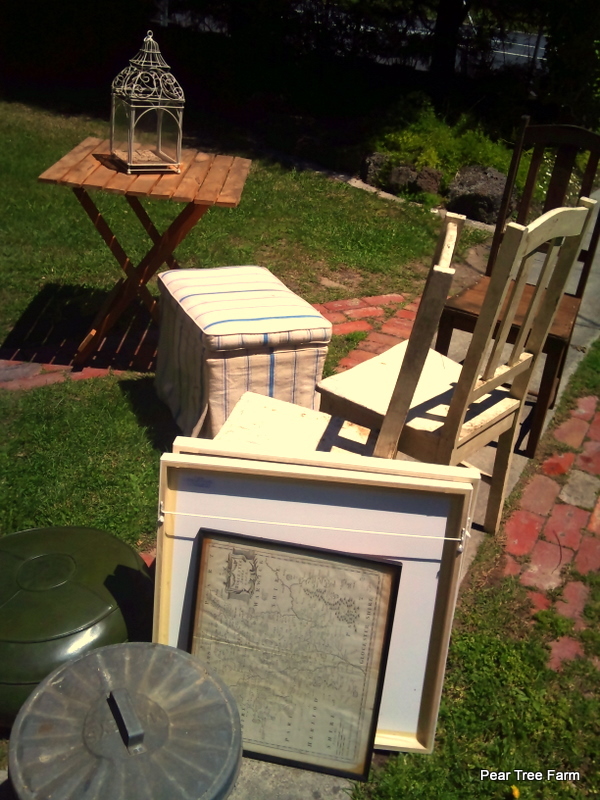 In Melbourne every so often, the council send out a notice to homes that you can get rid of any hard waste such as old mattresses, chairs, broken furniture, fence palings, wood, almost anything really and they will come and collect it free of charge. On spotting this hard waste....something started to happen to me....my eyes started to quickly scan the streets, my heart started to beat a little faster, my fingers where clenched with excitement....could their be any treasure amongst all the rubble? Was I going to spot my long coveted items....ie a pie cooler, a shabby chest of drawers, a vintage mirror...anything that I could possibly do up? Mr PTF annoyingly, did NOT slow the car down to an extremely slow crawl along the streets, as I would most certainly have done had I been behind the wheel....this may have been to do with the fact that we are currently trying to de-clutter our house and garage in order to sell the house and move and are not wanting to accumulate any more junk vintage treasures. Or perhaps it was the peak hour traffic? Anyway...as we sped by all the potential treasure, I resolved that this weekend I would go on a thrifting/junk crawl around the streets of Melbourne. The next day as we were going on a walk to the park....item no. 1 was spotted! A beautiful old wooden screen door. I love it! My lovely hubbie had to go back and get the landrover and pick it up after our walk....on the condition that it would have to stay in Melbourne until we move. No probs there, as long as I could keep my beloved old door! In the afternoon item no. 2 was snatched up as I drove home after a beauty appointment. A lovely old wooden chair....perfect for the verandah at Pear Tree Farm. That night after dinner I talked Mr PTF and my accommodating sister into coming on a junk crawl with me. In the cover of darkness we drove around the streets near my family's home. It was quite hilarious at times jumping in and out of the car, swallowing our pride and perusing peoples junk. I am happy to report however that it was not in vain. We had success! I found a wicker basket, perfect to store Little O's ever growing pile of toys, some old gardening tools...to appease Mr PTF, and a gorgeous white bed head, which I have plans for (more about that later). So successful were we and so many more streets to cover than we could possibly do that night, I determined to go again the next morning. Almost to the point where I was having withdrawals and was anxious about the fact that there could be vintage beauties out there....waiting for me...and I could not get to them fast enough. I convinced my other sister to come with me the next morning and for some reason she said yes. So off we went. Well, what a morning! 2 and a half hours later we came back with a car full to overflowing with vintage goodness. 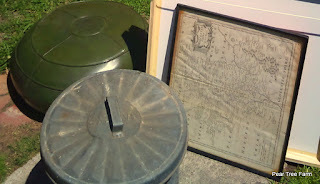 We found gorgeous old wooden chairs, a big metal trash can (Oscar the grouch style) a lovely vintage map of the UK in a black frame, a white lantern, an outside table for my mum a green vinyl foot stool, some huge near new white picture frames and a blue and white ottoman/dressing table stool. We were pooped, but rather pleased with our car full of loot. In fact the only reason we came back was because we literally could not fit any more stuff in. With more than one raising of the eyebrow from my dear Mr PTF on our return....he agreed to help me unload my goodies and even admitted that some of them were bargains....a big admission indeed. Here are some pics of some of our finds. I didn't have my good camera with me so unfortunately these will have to do. So there you have it. A weekend of junking. What fun I had and what fun I shall have fixing all my treasures up and finding places for them all at Pear Tree Farm. No bites yet for our place, its been on the market for a week now....fingers crossed. Rach, I can just imagine your delight in hard rubbish. Yet another similarity we share. 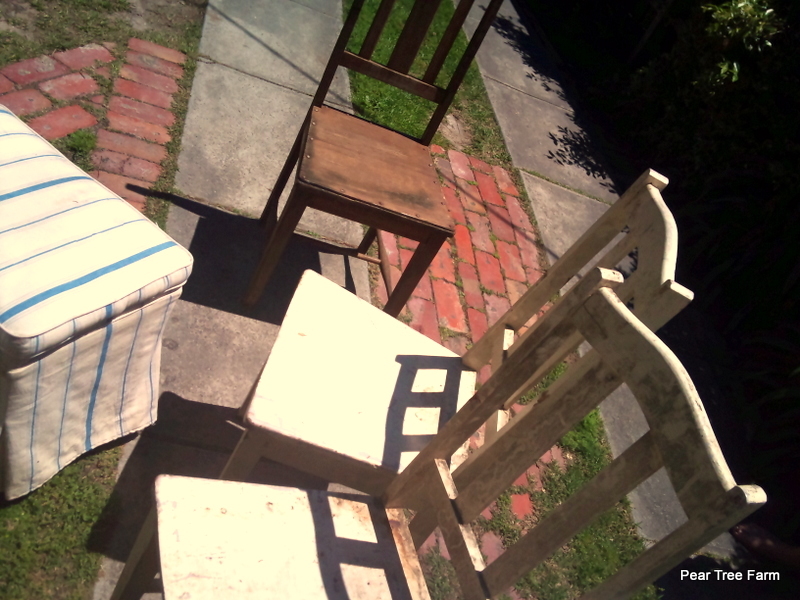 My first uni share house was pretty much entirely furnished with hard rubbish, including the most simultaneously ugly and comfortable chair I have ever come across. Certainly not as good as your "finds". Although check out http://www.abc.net.au/news/2011-03-22/arrest-raises-questions-over-scavenging/2647688 - you might get arrested!